This article was written on 07 Aug 2013, and is filled under author: successmontage. The Conjuring is James Wan’s sixth feature-length film, which follows the true case of Ed and Lorraine Warren, paranormal investigators whose cases have inspired films such as The Amityville Horror and The Haunting in Connecticut. More about the couple can be found here. I am going to keep this review as spoiler-free as possible, so I don’t ruin it for those who haven’t seen it yet. 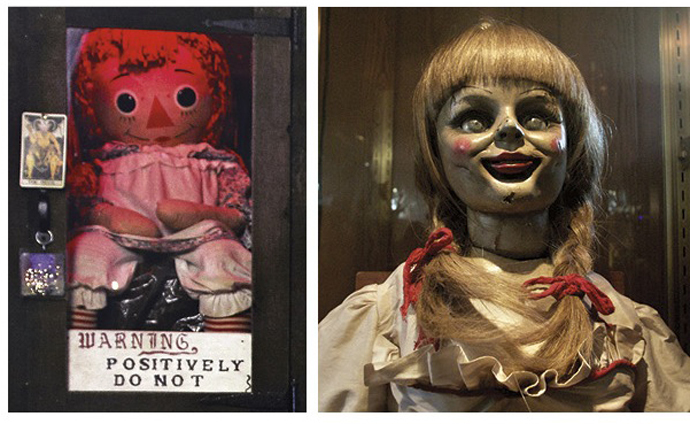 The real ‘Annabelle’ doll, compared with the creepier one used in the film. James Wan has been a favourite director of mine, ever since I watched the first Saw film. I’ve been impressed by his other work, though I felt that Insidious was a bit of a let down. However, I can confirm that The Conjuring is genuinely terrifying – far more than Insidious and even the creepy Dead Silence. I firmly believe this film is already on its way to becoming one of the greatest possession films ever. This film actually focuses on several cases; the opening shows some room mates talking about their Annabelle doll and how something had possessed it. This doll is actually real (shown above) and I thought this was a clever thing to include. The Warrens literally had a room filled with all of the possessed things you see in the film, and the realism is another thing which makes this film so scary. The second case, and the main focus of the film, is said to be the most malicious case the Warrens worked on. Whether or not it is real is of course debatable, but the fact these people actually existed is really cool. For once we have hard proof of the ‘based on true events’ tagline, instead of something just being loosely based. The Conjuring has certainly sparked an interest in the Warrens and their career. In addition to the fact that it’s terrifying (which I think many of you have already established), praise should also be given to the way the film was made. Once again, Wan has proven himself as a dedicated film maker through his varied use of camera angles, which were sometimes incredibly disorientating. The soundtrack, and also, lack thereof proved to be incredibly effective, and kept me on edge. The most effective scares occur when there is no sound at all – be warned! This film isn’t ruined by rubbish CGI monsters or demons, it relies very heavily on playing with the psychological elements. Much like Insidious, the horror doesn’t always stop during the day, which is a clever trick used by James Wan. You are on the edge of your seat 100% of the time, not just when the lights go out. I also thought the casting for the film was superb. Patrick Wilson (who you may remember from Insidious) and Vera Farmiga play paranormal investigators Ed and Lorraine. I can imagine it was a challenge as they are based off real people, but the characterisation was superb. They were characters that were very easy to connect and sympathise with. The family who the Warren’s go to help are also superbly cast, with the right mix of characteristics. The demon itself is also a terrifying thing, and we do see a very cool possession scene which has quickly became one of my favourites. I urge all horror fans to see this as soon as possible. If you aren’t easily scared, you might just meet your match with this one.